Teach yourself to dance with my instructional DVDs for Lindy Hop, Charleston, Jazz Roots and Burlesque. These DVDs are all available to purchase through Kunaki.com. These DVDs will ship from the USA and may take up to 3 weeks to arrive. 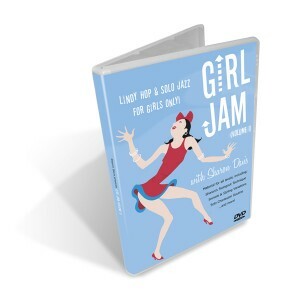 This is a DVD on solo jazz dancing, including five sections: 1920s Charleston Basics, Basic Vernacular Jazz Steps, Introduction to Solo Blues, Advanced 1920s Charleston, and Advanced Jazz Steps. There is tonnes of material – I counted, I teach 90 moves on this DVD! I often get asked, is this DVD just for girls? The answer is no, the moves I teach are for both guys and girls, but fair warning, the DVD was produced by my burlesque company, so I’m wearing a skirt and heels while I teach it! But these are the same jazz steps and Charleston moves that all swing dancers – men and women – need to know. Please be aware that this DVD is in the Australian standard PAL format (not NTSC), but has no country code or region restrictions. Therefore it will play on all computers and laptops worldwide. It will also play on many DVD players and game consoles outside of Australia, but not all. Please check your device’s settings before purchasing. In this DVD join instructor Sharon Davis to learn the basics of the Charleston, the biggest dance fad of the 1920s, and progress to advanced Charleston variations. The DVD also includes classic jazz steps from the 1930s and 40s, progressing to some advanced steps and combinations, plus an introduction to the slow and sultry style known as blues dancing. 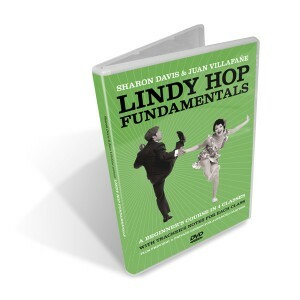 This is a DVD teaching all the basics of Lindy Hop, in four lessons, but for more advanced dancers it also includes notes for swing dance teachers and community leaders, on our philosophies of teaching Lindy Hop and building a swing dance scene. At the end of the DVD there is also a preview of a private lesson on the Swing Out, for advanced dancers. No region or country restrictions. International champion dancers Juan Villafane and Sharon Davis present the fundamentals of the original swing dance, the Lindy Hop. Newcomers to swing dancing will learn the basics of Lindy Hop in four lessons. Juan and Sharon will introduce you to the most important footwork patterns, moves and figures in Lindy Hop, with a focus on partner connection and style. Advanced Lindy Hop dancers will gain insight into Juan & Sharon’s philosophy on the core of Lindy Hop, and as a bonus feature, preview a private lesson on advanced fundamentals for experienced dancers. Dance teachers and people wanting to build a swing dance community in their home town, will find useful teacher notes, advice and ideas after each lesson. This is a DVD for swing girls! It includes swing out technique for followers, a section on my swivels and twists, some fancy footwork variations for your swing out, plus a jazz routine in high heels just for ladies. No region or country code restrictions. Join international Lindy Hop and solo charleston sensation Sharon Davis (and her dashing assistant, Kevin St. Laurent!) for girls-only lessons that every Lindy Hop follower and lady jazz dancer will love. This DVD includes material for all levels, including swingout technique for followers, swivels and styling variations, a solo charleston routine, and more. 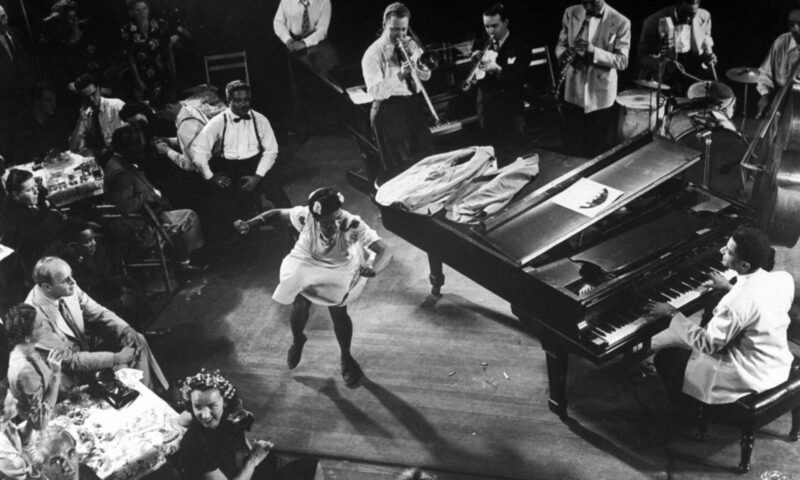 Swingout Salon – hear Sharon’s philosophy on the Lindy Hop swingout, and answer the most common questions for follower. Swivelicious – learn how to swivel, and how to make your swivels your own. Discover the Laws of Swivels, and learn four fancy swivel variations for your swingou. Charleston in High Heels – an unabashedly feminine solo Charleston routine, designed to show off your legs! Intermediate to advanced steps by famous flappers and glamorous starlets, including Ginger Rogers, Mitzi Mayfair, Joan Crawford and Eleanor Powell. Bonus feature – ladies can take inspiration from the great male dancers as well. As a bonus, see Sharon demo an advanced solo jazz routine for girls, but inspired by gentleman dance legends including Bill ‘Bojangles’ Robinson, John Bubbles, Leon James and Al Minns. I have a series of three DVDs on Burlesque, featuring myself and the other fantastic instructors from my burlesque company, Sugar Blue Burlesque. These are absolutely the most comprehensive burlesque DVDs available. They cover burlesque costuming, bump and grind, the art of striptease, feather fan dancing, chair dancing, showgirl conditioning, blues dance for burlesque, tassel twirling, and a lot more. Please be aware that this DVD is in the Australian standard PAL format (not NTSC), but has no country code or region restrictions. Therefore it will play on all computers and laptops, worldwide. It will also play on many game consoles and DVD players outside of Australia, but not all. Please check your device’s settings before purchasing. In Volume 1 of this three part DVD series, learn the art of classic burlesque with the showgirls and dancers from Australia’s Sugar Blue Burlesque. Learn about burlesque costumes, dance, the art of tease, fan dancing, chair dancing and more. The DVDs in this series are jam-packed full of information – these are absolutely the most comprehensive burlesque instructional DVDs available today. Contents include: Classic Burlesque Dance: Bump, Grind & Shimmy, The Art of the Garter Tease, Introduction to Feather Fan Dancing, The Art of the Glove Tease, Introduction to Burlesque Chair Dancing, Beginners Burlesque Floor Routine, Group Feather Boa Routine, Belly Dance for Burlesque, Latin Dance for Burlesque, Burlesque Costumes, Sugar Blue Burlesque photo album, footage from live burlesque shows. In Volume 2 of this three part DVD series, learn the art of classic burlesque with the showgirls and dancers from Australia’s Sugar Blue Burlesque. Builds on the lessons covered in Volume 1. Learn about burlesque dance, the art of tease, fan dancing, chair dancing and more. The DVDs in this series are jam-packed full of information – these are absolutely the most comprehensive burlesque instructional DVDs available today. Contents include: Intermediate Classic Burlesque Dance, The Art of the Boa Tease, Intermediate Feather Fan Dancing, Intermediate Burlesque Chair Dancing, Stretches & Conditioning for Splits with contortionist Kimtortion, Catwoman Floor Routine, Blues Dance for Burlesque, Sugar Blue Burlesque photo album, footage from live burlesque shows. In Volume 3 of this three part DVD series, learn the art of classic burlesque with the showgirls and dancers from Australia’s Sugar Blue Burlesque. Builds on the lessons covered in Volumes 1 and 2. Learn about burlesque dance, the art of tease, fan dancing, chair dancing and more. The DVDs in this series are jam-packed full of information – these are absolutely the most comprehensive burlesque instructional DVDs available today. Contents include: Advanced Classic Burlesque Dance, The Art of the Stocking Tease, Advanced Feather Fan Dancing, Advanced Burlesque Chair Dancing, Pasties & Tassel Twirling, Advanced Burlesque Floor Routine, Stretches & Conditioning for High Kicks with contortionist Kimtortion, Parisian Can-Can, Sugar Blue Burlesque photo album, Tassels Gallery, footage from live burlesque shows. >> Click here to purchase DVDs at Kunaki.com. These DVDs will ship from the USA and may take up to 3 weeks to arrive.